Pages from fairytales come to life as you find inspiration along the fabled castle-laden Rhine and its breathtaking tributary, the Moselle, with fascinating scenery of Europe’s steepest vineyards lining its shores. Join us for this enchanting trip on a five-star ship. Our Rhine River boat cruise has TWO available cabins left!! GOLD POINTS AT SEA!! BARBARA & ALEX will be aboard Crystal Serenity. Teaching Bridge. This a Regional at Sea. Robert Todd will be teaching aboard on the first leg of the journey, December 6-14. Barbara and Alex will then board the ship, December 14-22. NOTE: Events subject to change. To Book: visit www.alicetravel.com, or call 1-888-816-2457. This is NOT a REGENT bridge programme. Barbara & Alex are not working for the cruise line, only for the Vision group. 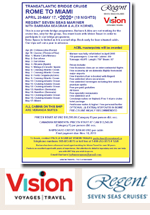 You must book with Vision Travel in order to participate in our bridge programme. Note: Space is limited as it is a small ship. Book early for best situated cabin. Our trips sell out a year in advance. PRICES START AT USD $10,599.00 Category F. per person dbl. occ. CANADIAN RESIDENTS: PRICES START AT CAN $13,549.00 Category G per person dbl. occ. SHIPBOARD CREDIT: $400.00 USD per cabin if booked by March 10, 2019. $200.00 USD shipboard credit if booked after March 10, 2019. John Rayner and Jill Thompson take this over in April 2019. John has represented Canada several times in International competition. He is a former bridge club owner (Mississauga-Oakville Bridge Centre) and is a superb teacher. He is entertaining and you will learn so much from him while also enjoying the learning. He has a great sense of humour also. SURPRISE ADDITION TO THE DUO!! Lee Daugharty, who all of you know and love, will be running the games at the Briars so that John and Jill can be more available for hosting the event. 4 Star luxury property, famous for all their spa, accommodation & cuisine. Wonderful food, lots of bridge tips, great bridge & fabulous ambiance. Wine & snacks after Friday & Saturday eve games. NOTE: TRANSPORTATION TO BRIARS NOT INCLUDED. IF YOU NEED HELP WITH TRANSPORTATION, CALL BARBARA FAR IN ADVANCE: 416-487-8321 AND WE WILL TRY TO ARRANGE A RIDE. NOTE: Fall 2019 - Cost if booked and paid by June 15, 2019: $559 per person (dbl. occ.) /$689 per person (sgl. occ.). After that date, add $30.00 per person. if you would like to hold a room for yourself for the 2019 Briars NOW! Our little tournament is now not so little. It is now an ACBL Sectional tournament. That means you win SILVER master points. We guarantee you a great time.